This was originally posted from the blog Rantings of an Amateur Chef. I have tried this recipe, love it and am passing it on. Today we have another guest post. When Michelle sent me the post titled Strawberry Fields Forever, it got me thinking. While not a superfan of The Beatles, I do like their music. Like many of their songs, Strawberry Fields Forever has an interesting story behind it. Strawberry Field was the name of a Salvation Army center close to where the young John Lennon grew up. The song was to make it into the Sgt. Pepper’s album but was released as a single instead and there were three versions recorded. At the time of his death, Lennon is reported to have thought that Paul McCartney had sabotaged the recording of the song that was released. Interesting stuff. Thanks for the side trip and welcome Michelle from Eat and Sip in the City…. A big thanks to The Ranting Chef for having me here again and I hope everyone is enjoying their summer! Don’t you just love ripe berries this time of year? 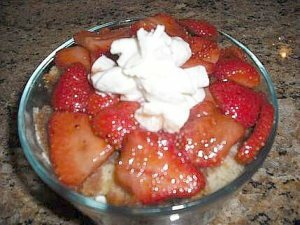 For this recipe for Layered Balsamic Strawberries with Pound Cake and Cream, I used strawberries that I picked at a local strawberry field and farm. I know what you are thinking. Balsamic vinegar with strawberries? It is a winning combination, let me tell you. It was way too hot for me to bake up a pound cake, but feel free to make that part from scratch. I used an already made loaf though to save time and effort. I also made a small portion based on the clear bowl I had, but feel free to make much more, in a bigger dish. Or on the flip side, you can use mason jars and make individual desserts in them! First place strawberries in a bowl and sprinkle on sugar. Then drizzle in your vinegar and stir. Next grind your crushed black pepper over it and set aside until you will be serving them and making your dessert. Once your balsamic strawberries have marinated for at least an hour, begin creating your dessert, which will look similar to a trifle, with layers of cake, cream, and fruit. 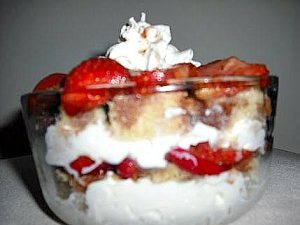 In a glass bowl, begin placing pieces of cake, followed by a drizzle of the vinegar and the balsamic strawberries mixture, and then whipped cream. Then repeat to fill your bowl to the top, depending on the size of your dish/bowl, just like making a lasagna. For a round dish, cut the pound cake into slices, then into cubes to fit around the edges of the bowl but for a square glass dish, you can keep it in bigger squares/slices. Serve immediately, with whipped cream on top of each serving!